March | 2011 | Wait... What? I received a random email last night from F+W Media asking me to advertise their fundraising campaign for Japan on my blog. I wondered if they had ever read my blog. But that’s beside the point. I’ll commend F+W for raising funds and having the good sense to not try sending volunteers and goods in kind to Japan, and for working through a known organization with emergency capacity like the Red Cross. Nothing against Japan and its people. I was probably as shocked and stunned by the earthquake and tsunami there as anyone else who watched it from afar and who has some close Japanese friends who desperately wondered how their families were faring. But since Japan doesn’t seem to need more funds, I wonder if F+W Media would consider another crisis in their awareness raising and fundraising efforts. That country is entering into a civil war that has the potential to shake all of West Africa. Some 1 million people are fleeing the violence. Mercenaries from Liberia (the country next door) are already fighting in Cote d’Ivoire. According to a friend of a friend who’s in Cote d’Ivoire, Ivorian National TV is broadcasting xenophobic messages stirring aggressions against neighboring countries and their citizens in Ivorian territory. This explosive mix could throw the whole sub-region into war. For an overview on the Cote d’Ivoire crisis check my previous post “Cote d’Ivoire and the thinking trap” or Blog for Cote d’Ivoire, which lists a number of resources on the crisis. Funds raised for Cote d’Ivoire and Liberia? 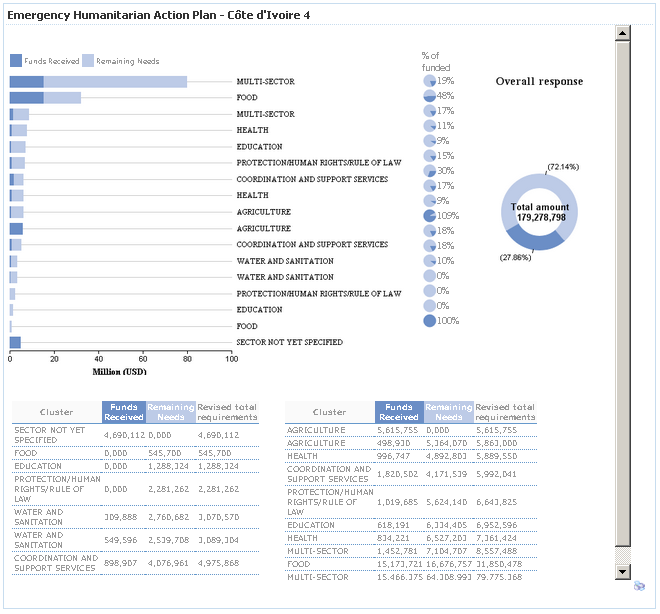 As of March 28, OCHA reports a 10th of that: $44,924,193. 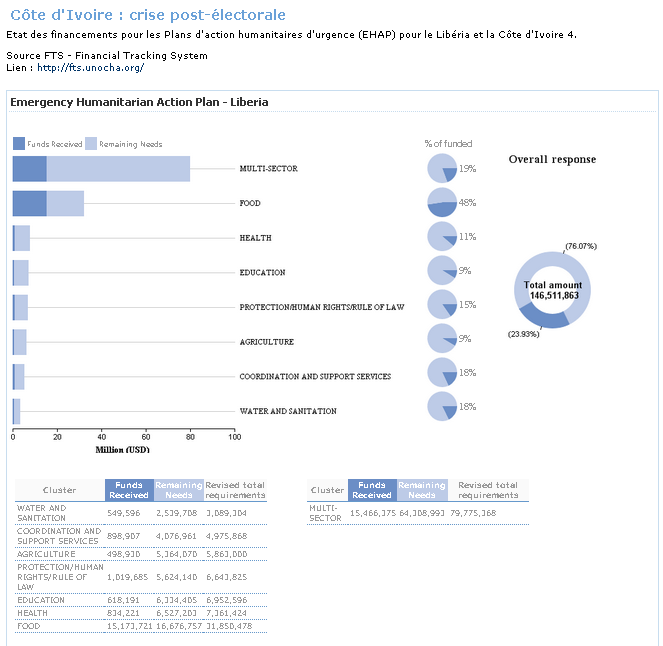 Maybe we should be happy that the donations that Japan doesn’t need might go the unfolding and critical situation in Cote d’Ivoire, which no one seems to care about…. We should be thankful for the Asterisk, as Cynan says. And then there is the military intervention in Libya, which I’m not sure how I feel about. I’m following the situation there and in several countries in North Africa and it’s gruesome. But it’s hard to understand how choices are made. A friend of mine living and working in West Africa wrote to me today, and I can understand how he is feeling. It must be terrible to be there, watching “never again” happening again and being powerless to stop it. “It seems incomprehensible why the international community does not intervene in Cote d’Ivoire whereas they are happily bombing Libya in the name of Human Rights. Strictly speaking in the case of Libya there is a revolution going on against a Head of State in power (I am not commenting here on the type of leader he is!). In Cote d’Ivoire the elected head of state cannot gain power for reasons known, and the population is persecuted and terrorized by his contestor. Wouldn’t it seem logical that the international community intervenes in Cote d’Ivoire instead? They refuse saying that Africa has the AU who should deal with this and that they were not on crusade to liberate the continent from its problems. On a flight home from Kenya last summer, I sat next to a young man from Burundi. His country was just holding elections, and we got to talking about them. I’d heard people calling the elections a sham because the opposition boycotted them, and there was only one candidate (from the ruling party) to even vote for. I asked what he thought about that situation and the current president. He said ‘Well, you know, we Africans…. sometimes these guys have their own style of doing things which others may not understand.’ We got to talking about politics in countries near Burundi and African big men who don’t want to step down. He kept joking, with each subsequent leader: ‘Hey… well, you know, I guess he has his own style too.’ Seems there is a lot of personal style to be reckoned with. Consider Laurent Gbagbo in Cote d’Ivoire who’s refused to step down as president and whose conflict with internationally recognized president-elect Ouattara is bringing (has brought?) the country to civil war. I’m about as far from a Cote d’Ivoire expert as you can get, never having visited the country and not having a great handle on the history or much knowledge about the current situation. So I went digging for some news articles and opinion pieces so I could understand things better. ‘The election was part of a peace process that began after the September 2002 rebellion and was endorsed by several accords, the latest the 2007 Ouagadougou Political Agreement that all candidates, including Gbagbo, accepted and that set out compromises on organisation and security for the balloting. Ouattara won the run-off with a margin of more than 350,000 votes over Gbagbo. Aaron Bady of ZunguZungu goes deeper and analyzes the historical roots of the conflict in his post Our deafening silence on the Coast of Africa: Cote d’Ivoire and our Myth of Continents, which I’d encourage you to read in full. ‘This is, in other words, about the political power structure working to limit who gets to politically represent and be represented in this “African” nation, precisely by drawing a line to separating “North Africa” from “West Africa,” in politically interested ways, to maintain political control for the ‘real’ Ivoirians in the south. Without denying that there might be other bad guys in this story, the fact remains — virtually unspoken — that ten years ago, Ouattara’s ethnic origin as Burkinabé — his parents were from Burkina Faso — was used by politicians from the predominantly Christian southern part of the country to disqualify him from running for the presidency; a political campaign of “Ivorité” worked to distinguish between “indigenous Ivorians” and “Ivorians of immigrant ancestry,” as a thoroughly programmatic effort to dis-enfranchise the (largely Muslim) north by lumping them all together with the (many) immigrants in the north who originated Burkina Faso. The current violence started with a disturbingly analogous move: after Ouattara was declared to have won the presidential election — by the UN, ECOWAS, the AU, and all international observers — the Gbagbo controlled Constitutional Council threw out 660,000 votes from the north and gave the election to Gbagbo. The organization where I work operates in Liberia, and so I’ve been getting updates about the situation on the Cote d’Ivoire-Liberia border, where we’re providing some support to the large number of refugees streaming into Liberia. These updates describe a deteriorating situation. Ghana, Guinea, Mali and Burkina Faso haven’t received as many refugees but are still starting to feel the effects of the conflict heating up. The past week saw a spill-over of violence onto the Liberian side of the border as armed Ivorians entered the Liberian territory and attacked Liberian and Ivorian nationals who were found along the North Eastern Liberia-Cote d’Ivoire border. UN security troops were deployed to put an end to the fighting and gain control. Serious shooting has also been reported along the South East Liberia-Cote d’Ivoire border, accelerating the influx of refugees into the counties of Maryland and Grand Gedeh. One report says that in Cote d’Ivoire, rapes, abductions and killings are being committed by people supporting both sides and influential leaders appear to be deliberately stimulating attacks against political opponents, other ethnic groups, nationals from other West African countries, as well as UN staff and operations. I’m someone who rants quite a bit about the negative images we associate so often with Africa and Africans. But looking at the information available about the current situation, I’m having a hard time finding any hope there. I wonder what solutions there really are, where they come from, and if and when these cycles will end. Is it because I haven’t visited Cote d’Ivoire myself that it’s hard to see beyond the negative narratives? Is it because I don’t personally know the day-to-day ‘place of friendly people, amazing fresh fruit, long and unspoilt tropical beaches ‘ that John James describes? In my mind, I keep coming back to the narrative about Africa’s ‘big men’ and their ‘personal styles’. Seems I’m also caught in the thinking trap that Aaron laid out. This is a guest post from Lil Shira, one of the girl delegates who attended the 55th Session of the Commission on the Status of Women in February, 2011. 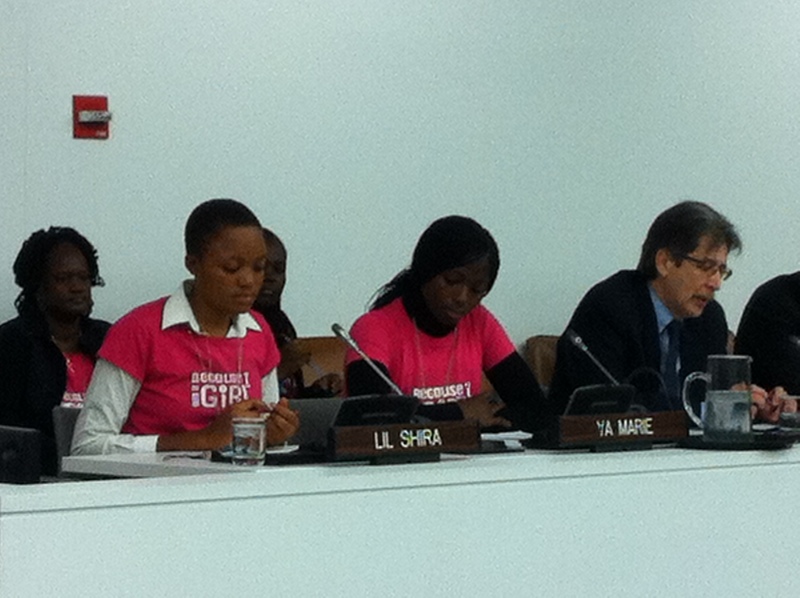 Lil Shira was part of a Plan led Girl Delegation which took part in high level panels, side events and caucuses. This post appears complete in its original format. 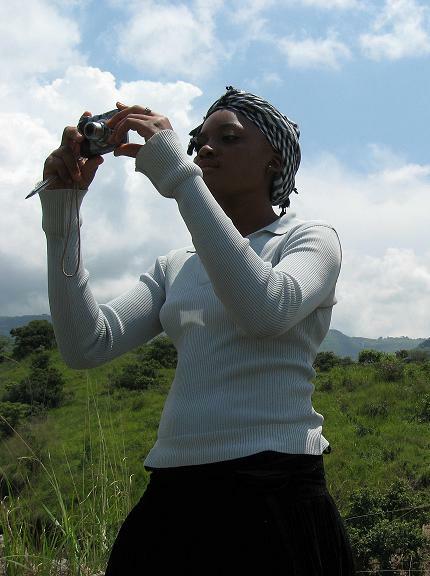 You can read a post by Fabiola, another of the girl delegates from Cameroon, here. My name is Lil Shira, a high school student and a Cameroonian. I am the second child out of five children in my family, three girls and two boys, and we live in a rural area. Because I am a girl I was selected by my school authority to be part of the journalism club in the school. This paved my way into YETAM (Youth Empowerment through Technology, Arts and Media) project sponsored by Plan Finland since the Journalism club was chosen for this project. Because I am a girl I had to use the skills I have acquired in YETAM on music, media and ICTs to indentify issues like the problem of early and forced marriage, high rate of school dropout and violence against the girl child. Because I am a girl, I had to mobilize other youth (girls and boys) victims, so as to speak out as a unique voice, to raise awareness to the general public using music, drawings, drama, poems, videos, computers and overhead projector as tools. This led to many local advocacy actions spearheaded by us. I was also very happy to celebrate the 21st anniversary, in Yaoundé in Cameroon, of the ratification of the Convention on the Rights of the Child within the framework of YETAM project. These created a big impact in my life, the lives of my friends, youth, school, family and my country. All these activities took me to a higher level because I was again selected, this time to be one of the girl delegates to represent Cameroon in the 55th session of the UN Commission on the Status of women (CSW) in New York City. Lil Shira presenting at the CSW. I was very happy, excited together with my friends and family members and I was planning and preparing on the role I was going to play while in New York. My expectation was to work with other youth from different region and country but did not really expect I was going to talk to Ministers from all the members’ state of the UN. I did my first presentation with the Canadian Minister on a panel about the importance of commemoration days and the importance of setting up an International day for the girls. Another thing which made me feel so opportune was the panel with UN women Ministers in the UN building. I was very impressed seeing ministers from over two hundred countries and above listening to me and in effect giving a positive response to the issues I presented. In fact their reaction made me feel at home and so happy. I was equally happy to listen to other girls raise issues like gender based violence and discrimination in their various countries and what they have been doing to combat it. Coming in contact with girls from Sierra Leone, Finland, United States, Indonesia, Canada and others, not mention to share our ideas, was so wonderful and exciting. This was a forum for me to dialogue with them to know more about them and some of the issues affecting them in their own country which was contrasting with mine. Though I was nervous during my first presentation, meeting new faces it all passes away like a breeze and I did not have any complex because everything was cute. Life in the US to me was very enjoyable and meaningful, but I could not stop complaining of the cold and snow. In addition, I tried eating food not familiar to that of my home country. All these contributed greatly to the wonderful experiences I had on the weather condition and the food. I have learned to adapt to situations wherever I find myself. I hope to continue sharing this experience so that others may learn from it. This is the time for girls to take up the challenge. I know my rights and have claim them, and no one can take them from me because I am a girl. Thanks to Plan International, Judith Nkie our Chaperone, Kate Ezzes and Lia de Pauw.